The next time you’re enjoying a slice of deep dish, whether you are visiting a pizzeria or ordering pizza delivery in Palo Alto , try one of Pizza Chicago’s delicious salads. 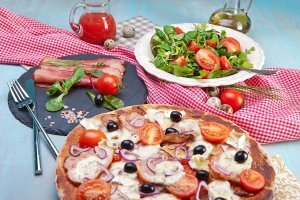 Though you can get plenty of nutrients from vegetable toppings on your pizza, there is something very refreshing about the taste of homemade dressing on a crisp salad. If you like your pizza and your salad simple, select the Caesar. Classic Caesar dressing, crisp Romaine lettuce, crunchy croutons, and fresh grated Parmesan cheese make this perennial favorite salad shine. When you’re in the mood for a salad with a few more ingredients, order the house salad, which besides the lettuce also includes carrots, tomatoes, cucumbers, red onion, and croutons. Our special veggie lovers salad is the ultimate garden delight, featuring roasted zucchini and red bell peppers, artichoke hearts, red onions, sun dried tomatoes, diced avocado, and feta cheese atop a bed of Romaine and spinach, all tossed with a delicious vinaigrette dressing. All salads are also available in family-style catering portions for your next pizza party.